Begoro (E/R), Nov. 13, GNA - President John Agyekum Kufuor, Saturday said the government would not discriminate against any ethnic group in the country. He pledged the government commitment to forge unity and co-operation among all ethnic groups for an effective and efficient socio-economic development of the country. President Kufuor was addressing a durbar of the chiefs and people at Begoro in the Fanteakwa District as part of his two days visit of the Eastern Region. He was reacting to allegations in the district that settler farmers especially, Krobos in the area would be expelled if the New Patriotic Party (NPP) was given a second term of office. President Kufuor asked Ghanaians to exercise patients wherever they may be for them to go about their normal duties and vote massively to return NPP to power. He said it was the same politicians that did not manage the economy well that turned to peddle falsehood to cause disaffection among the people and the party. "The NPP is made up of membership from all parts of the country and there is no way it will discriminate against any ethnic groups", he added. 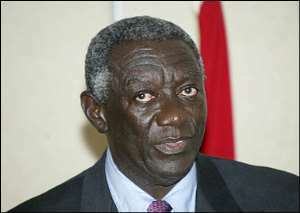 President Kufuor said the Begoro Presbyterian Senior Secondary School would be included in the next batch of the second cycle institutions to be upgraded next year. Osabarima Awuah Kotoko II, Begorohene and Bekumhene of Akyem Abuakwa Traditional Area, warned all trouble makers going round the area misinforming settler farmers especially Krobos that they would be expelled when the NPP was returned to power to desist from the act. "We have co-existed peacefully under all successive governments in Ghana. I do not think there are any grounds for discrimination now that the world is moving towards global village", he added. Osabarima Kotoko appealed to leaders of all the political parties to exhibit a high sense of decorum in their campaigns. "Our main focus is to unite and develop the country under a good leadership in a peaceful and stable atmosphere", he said. At Nkawkaw, President Kufuor advised a large crowd of party supporters to use their democratic power to elect a government that would ensure peace, stability and development for the country. He said the NPP government's four years rule have reduced inflation, interest rate, stabilised the cedi as well as increase cocoa production from 45,000 tons to 750,000 tons. President Kufuor urged them to vote for him as President and the three incumbent Members of Parliament in the Nkawkaw, Mpraeso and Abetifi constituencies to continue with the good work to ensure total development in the country. He said a solid economic foundatio n have been laid and therefore, should avoid voting for Independent Parliamentary Candidates for the party to have majority win in Parliament in the December elections. President Kufuor addressed similar durbars at Kukurantumi, Kwabeng and made brief stopovers at Osiem and Anyinam.